A visionary approach to eliminating industrial waste streams . .. Here is a revolutionary solution to problems of industrial wastemanagement by creating a system of environmentally balanced"industrial complexes" in which groups of industrial plants consumeeach other's waste--not only benefiting the environment, but alsosignificantly reducing production costs. 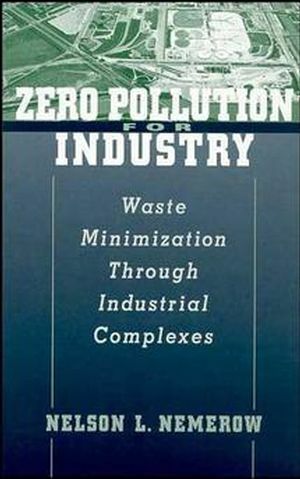 Providing a clear introduction to this novel approach, ZeroPollution for Industry goes right to the heart of whatenvironmental scientists, engineers, and administrators grapplewith these days. It takes pollution prevention to the next level,past current reduction and reuse methods, and anticipatesgovernment regulations and societal trends that would factorenvironmental damage into production costs. Concise and uncluttered, this book is an eye-opener for anyone whowould like to work toward a world free of industrial pollution inour fragile environment. NELSON LEONARD NEMEROW is a leader in the field of industrial waste management. A professor for over 40 years at the University of Miami, as well as Syracuse, North Carolina State, Florida International, and Florida Atlantic Universities, he is the author of 18 books on many aspects of pollution. Rationale for Attainment of Zero Pollution. Waste Minimization by Reuse Recovery. Waste Minimization by Recovery and External Sale of Products. Environmentally Balanced Industrial Complexes: An InnovativeSolution to Attain Zero Pollution.